Greer's OC | LemonAID Stand for Japan! Calling all kids ready to make a difference! Team Kids needs children (or their schools) to host their own LemonAid stand (or hold a bake or garage sale) anytime between now and next Sunday to benefit those affected by the recent tragedy in Japan. All proceeds of Team Kids LemonAID Japan Project will go to the American Red Cross Japan Earthquake/ Pacific Tsunami Relief fund. And Sunday, March 27, from 10 a.m. to 3 p.m., bring your LemonAID money raised to the Team Kids LemonAID Store at Orange County Great Park Farmers Market in Irvine. Visit the Team Kids website for updated Japanese Earthquake Response Efforts information, registration and final money collection/celebration details. Since its inception in 2005, kids participating in LemonAID have raised and donated more than $45,000 to charity through in response to Katrina, the Indonesian Tsunami, the Santiago wildfires and the earthquake in Haiti. Contact Michelle Franco at mfranco@teamkids.org or .949.861.4887. Consider yourself a pro food eater, a sushi freak, or always up for a competition? Then make it over to a sushi showdown at RA Sushi at The District at Tustin Legacy on Sunday from 3 to 7 p.m. RA Sushi is throwing its first Maki Madness Sushi Eating Contest to coincide with the NCAA March Madness. One person will earn the title 2011 Maki Madness Champion (the fastest eater) and will win sushi for a year, or the equivalent to a dozen $50 RA Sushi gift certificates. Space is limited to 40 participants so all interested gamers must register in advance here. Contestants must be at least 18 years old to participate. RA will feature its signature Tootsy Maki, with crab mix, shrimp, and cucumber rolled and topped with crunchy tempura bits, and drizzled with sweet eel sauce for $7 and offer guests a selection of themed drink specials from $4 to $8. 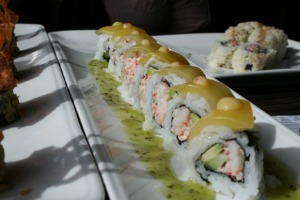 RA Sushi Bar Restaurant at The District at Tustin Legacy. 2401 Park Ave. in Tustin. 714.566.1700.